Moisture-Management fabric "pulls" water or perspiration from your skin, spreading it across the surface of the fabric where it quickly evaporates. This keeps you dry and more comfortable. Our sleepwear uses the latest technology to work hard for you, yet they are luxurious feeling and durable. People perspire for many reasons, from physical exertion or warm temperatures, to "night sweats" or hot flashes. Living in cold climates that require extra layering can be a challenge. The layer next to your skin should keep you both warm and dry, but conventional underwear often holds moisture in. Our "wicking" fabrics are the answer. We make a variety of clothing that keeps you comfortable and dry, and also kills bacteria. Most of our wicking fabrics contain Silver, the best antimicrobial known. Silver kills bacteria by smothering the bacteria molecule. It is bacteria that causes odor, so you and your clothing will smell fresher! Silver is natural and safe. Polartec® Power Dry® with Odor Resistant Technology keeps your skin dry when you sweat and features a natural anti-microbial to prevent odor. Silver fibers permanently knit into the fabric neutralize odor-causing bacteria. A patented bi-component knit construction uses different yarns on each side of the fabric, one that is optimized to move moisture away from the skin, the other to dry quickly. Moisture and high relative humidity next to the skin cause discomfort. Polartec® Power Dry® keeps the skin dry through three complementary mechanisms. 2) "Touch points" on the fabric inner surface draw off the sweat. Sweat is wicked off the skin to the outside of the fabric where it spreads rapidly for evaporation. Polartec® Power Dry® fabrics move at least 30% more moisture away from the skin than single component fabrics. Polartec® Power Dry® fabrics with Odor Resistant Technology also effectively combat body odor by inhibiting the growth of odor-causing bacteria in the fabric. Odor Resistant Technology is not a surface treatment and contains no chemicals. It is pure silver, micro-encapsulated in the yarns that are knit into the fabric construction. It will last for the life of the garment, is safe, natural, and offers permanent odor protection. That means that garments will stay fresher, longer between washes. Naturally, it makes sense to have clothing that utilizes this effective antimicrobial technology. Other types of high performance clothing use chemicals to kill bacteria. When you sweat, these chemicals can enter the body through open pores, which is unhealthy. They also wash out after a short while, which is why those garments start to retain unpleasant odor. 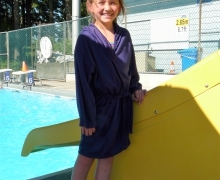 A moisture-wicking fast-drying pool wrap (swim suit cover up) that is perfect for the pool or beach.